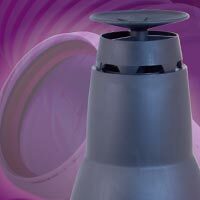 PolyPro is a polypropylene vent pipe for use with ANSI Category II and IV gas burning appliances, including tankless and storage high-efficiency water heaters, condensing boilers and warm air furnaces. PolyPro is listed by Intertek to the ULC S636 standard in Canada and is rated as a Class IIA, IIB and IIC vent system suitable for exhaust temperatures up to 230°F / 110°C, and a maximum positive pressure of 8 in-w.c.
No leaching or off-gassing of heavy metals or carcinogens. Releases only oxygen and carbon dioxide when burned. Ideal for all condensing gas/oil appliances. Extra thick wall means it is more stable & secure. 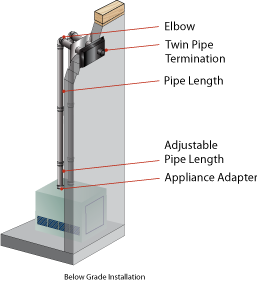 Tight seal at every joint...expands and contracts with weather and temperature changes, so there is no flexing or cracking in the venting. Higher sustatined operating temperatures than PVC/CPVC. No flammable, messy or harmful glues, cements or solvents needed at connections. No waiting for glue curing time during installation. Screws into studs for a sturdy and secure brace. 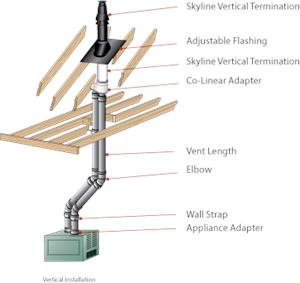 Time saving wall bracket clips quickly and easily to PolyPro pipe. 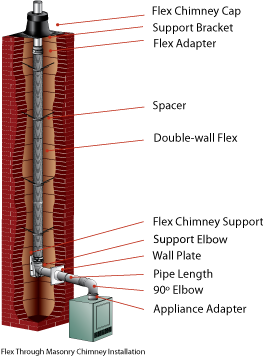 Gasketed connections make easy removal and replacement of components.